The Indian subcontinent is a term mainly used for the geographic region surrounded by the Indian Ocean: the Bangladesh, Bhutan, India, Maldives, Nepal, Pakistan and Sri Lanka. 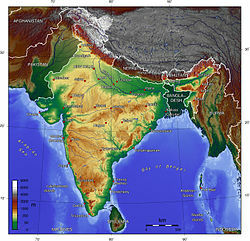 The subcontinent was once part of Gondwana, the ancient southern supercontinent. Geologically, the origin of the Himalayas is the impact of the Indian tectonic plate travelling northward at 15 cm per year to slowly hit the Eurasian continent, about 40-50 million years ago. The formation of the Himalayan arc resulted as the lighter rock of the seabeds of that time were easily uplifted into mountains. An often-cited fact used to illustrate this process is that the summit of Mount Everest is made of marine limestone. About 50 million years ago, this fast moving plate had completely closed the Tethys Ocean. The existence of the Tethys has been proved by sedimentary rocks settled on the ocean floor, and the volcanoes that fringed its edges. Since these sediments were light, they crumpled into mountain ranges rather than sank to the floor. The Indian plate is still driving horizontally below the Tibetan Plateau, which forces the plateau to move upwards. The Indo-Australian plate is still moving at 67 mm per year, and over the next 10 million years it will travel about 1,500 km into Asia. About 20 mm per year of the India-Asia convergence is absorbed by thrusting along the Himalaya southern front. This leads to the Himalayas rising by about 5 mm per year, making them geologically active. The movement of the Indian plate into the Asian plate also leads to earthquakes from time to time. ↑ 1.0 1.1 Kind, Rainer 2007. "The fastest continent: India's truncated lithospheric roots". Helmholtz Association of German Research Centres. ↑ Kumar, Prakash et al. 2007. "The rapid drift of the Indian tectonic plate". Nature 449: 894–897. doi:10.1038/nature06214. This page was last changed on 1 February 2019, at 00:45.